He arrived from Warsaw in 1937 on the same boat as this writer's father and shared a house in Carlton with his sister, the dancer Ruth Bergner, and quickly found the 'Heide' gang of Arthur Boyd, Albert Tucker, Noel Counihan, Sid Nolan and Vic O'Connor. 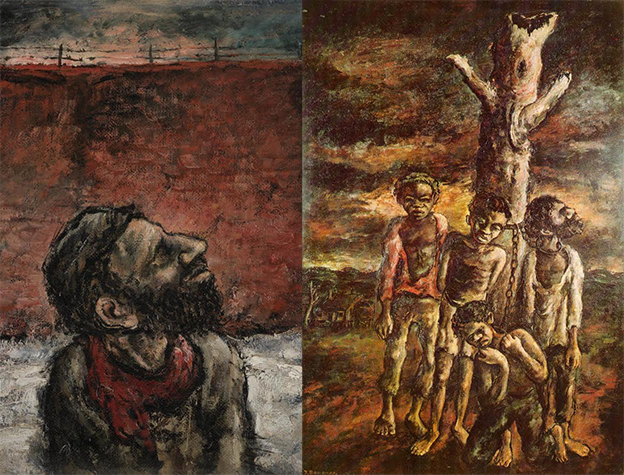 He shocked the staid art world with his painting 'Aborigines Chained To A Tree' an image he had seen in the Sydney Morning Herald and then painted in oil on masonite - canvas being too expensive in an Australia still recovering from the Great Depression. Yosl said that with all the trauma in the world he couldn't paint pretty pictures, so he painted the human condition - and is believed to be the first Australian painter to do so. He and his contemporaries believed that art could change the world. The late University of Melbourne art historian, Prof Bernard Smith, coined the term "post-modernism" to describe the work from a 1944 Contemporary Art Society exhibition of Yosl Bergner with Noel Counihan and Vic O'Connor, depicting European Jewish refugees as well as scenes from Melbourne's poverty-stricken inner suburbs, primarily Fitzroy. Yosl was born in Vienna, but his family moved to Warsaw when he was an infant and he grew up in the Jewish neighborhood around Novolipki Street. It was a vibrant community, but the rise of anti-Semitism was clear and many families were attempting to emigrate. His father, known as Melech Ravitch, was a writer and intellectual who translated Franz Kafka into Yiddish. In 1934 Ravitch undertook an expedition to the Kimberleys in Western Australia to see if the region would be suitable for the yet-to-be-formed Jewish homeland. The fruitless journey laid the ground work for other members of the Bergner family to migrate to Australia, just before the Holocaust. Yosl's sister Ruth arrived in Australia in 1936 and in 1937, Yosl followed. He was accepted as a student at the National Gallery School and between a range of part-time and casual jobs, including selling socks at Victoria Market, painted some of his most impressive early works. Two of Yosl's early works stand out: Aborigines Chained To A Tree and The Ghetto Wall. The profiles of one of the Aboriginal men and the Jewish father are identical - an expression of "God, why have you forsaken me?" Yosl was briefly married to Marisha (Mary) Tauman but in 1948, left Australia for Paris where he re-met fellow National Gallery School student, Audrey Keller, who would become his life-long partner and mother of their daughter Hinda. Yosl Bergner's paintings "Aborigines Chained To A Tree" & "The Ghetto Wall" share a striking resemblance in the expression of each painting's profile-facing subjects. In Israel, Yosl was unable to paint the politics of the country, but there are allusions to it with birds flying through the wings of butterflies. Having grown up in the non-Zionist socialist Jewish Bund and later a member of the Communist Party of Australia, he said that he was never a Zionist, but hated anti-Semitism and that is how he ended-up in Israel. Much of his work - like Arthur Boyd's - is rich in symbolism and can take quite some time to understand. Yosl was also the recipient of the Dizengoff Prize, the Israel Prize and was made a life member of the National Gallery of Victoria. His images have illustrated many books and he designed costumes and sets for numerous stage plays. Just 12 months ago - pretty much to the day - we said goodbye to Yosl and Audrey at their home in Tel Aviv, having earlier spent some time with them and introduced my children, Alex, Yosl Arthur (named after Yosl and Arthur) and Joshua. While he had slowed physically, he had not changed intellectually and was still working in his studio every day. The smell of oil paint and gum turpentine rich to the nostrils. We went to the studio and Yosl pulled out pictures from the racks and toys and musical instruments and entertained us for several hours - even though we only meant to drop in for 30 minutes. 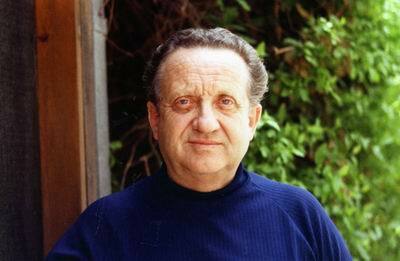 His death is a great loss to the world arts community, especially for Australia and lsrael. David Langsam interviews Keith Richards of the Rolling Stones. A eulogy for the legendary Aboriginal artist, Lin Onus. David Langsam investigates what could potentially be Australia's greatest art export. A summary of Ralph Steadman's life thus far; his artwork, life with Hunter S. Thompson, and everything else. An interview with the late Arthur Boyd, about politics, art, and his life. - David Langsam's obituary for Israeli/Australian/Polish artist Yosl Bergner. - review of Mirka Mora's autobiography. - interview with artist Mirka Mora. - an in-depth interview with Australian artist Victor O' Connor. - a eulogy for the legendary Aboriginal artist and activist, Lin Onus. - an interview with world-famous artist Arthur Boyd. - an interview with controversial artist Juan Davila. - A summary of Ralph Steadman's life thus far; his artwork, life with Hunter S. Thompson, and everything else. - a recount of Juan Davila's latest art show. - David Langsam investigates what could potentially be Australia's greatest art export. - interview with Australian artist Gary Willis. - Keith Richards gives his health tips and advice to David Langsam, in this exclusive interview. - David Langsam interviews the one and only, Keith Richards.